I sat back up on the exam table, and began peppering my doctor with questions about potential treatment plans. I was suffering from an infection that had already killed two of my children in utero. This new reality had shaken me to the core. I never expected this kind of trial after my first three kids came so quickly. It was not until we lost two of the last three pregnancies that we realized something was wrong. Now I was waiting the long wait of those hoping for healing and babies, and it was hard to not feel so alone. “Sorry,” I told her, “I am just bad at waiting, but I guess this is a good chance to become more patient.” She laughed at my self-analysis, assuring me that we would know what to do next soon. I closed my eyes and reached out to God, asking Him for the strength to bear this trial longer. Like the Apostles in the Gospel today, I had waited for Him by the boat, only embarking when I was sure the time was right, but now it felt like “[i]t had already grown dark, and Jesus had not yet come.” (John 6:17) I clung to my husband in the boat as we crossed the rough sea of this journey. I sought in the depths of my soul and reached to the heavens in prayer for some glimmer of hope. The next week I got a call from the doctor; the infection had responded to the treatment. Things were okay for now. “It is I. Do not be afraid.” (John 6:20) There Jesus was, to my surprise, walking along the water. Following close beside the whole time. The sun came out as the storm cleared away. I called Him into the boat, but then it bumped against the shore. We were already there together. I do not know what will happen next, what God’s plan is for the future. There may be more storms to encounter, but for now there is a reprieve. The complications may return, but I will strive to hold onto the reality that Jesus is always close to those seeking to do His will. 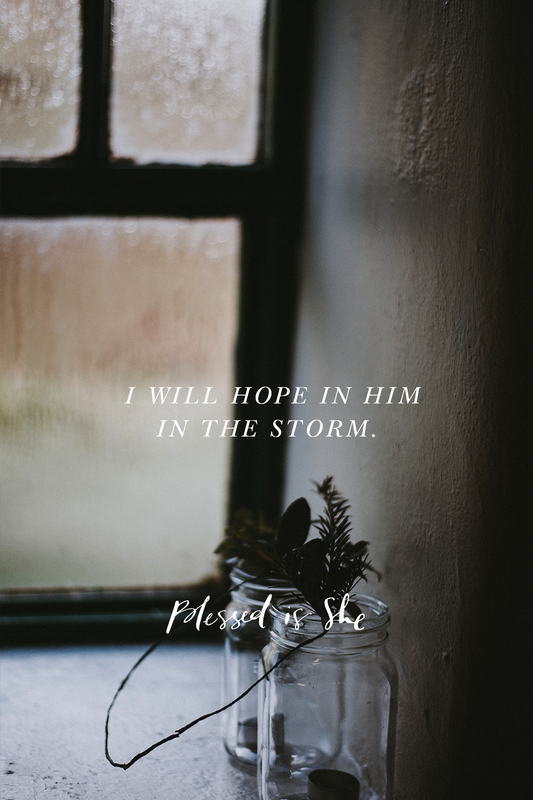 I will hope in Him in the storm. Jesus is always close to those seeking to do His will. Dearest sisters, sometimes the hardest part of following God is faithfully doing what He has asked us to do while waiting for Him to reveal Himself to us. Do not be afraid in the long, lonely uncertainty of this life. He is with you. This devotion has touched my heart! I am a two time cancer survivor currently recovering from breast cancer. Praise God that He is with me through the storm. He will never leave us! I can hear Tom Petty wailing, “The wai-yay-ting is the hardest part.” Yes, and yes. Waiting for pregnancy results, biopsy results, job interview, house loan. It’s all challenging. The not knowing is worse than any actual bad news. Thank you for putting meat on the bones of my ephemeral drifting thoughts. Thank you for sharing some specifics of your story. I agree with everything you said. I invite you to consider the “Gifts of Waiting”. https://giftsofwaiting.wordpress.com/ These are Signs of God’s Love for Us, so that the Joy of Our Salvation can not be taken from us. I do not “wait” well. Having finally admitted that, I turned to Mary and asked her to teach me her prayers of waiting that her heart prayed on Holy Saturday. Mary, is full of the Grace of the Gifts of Waiting. I now try to compel my heart to turn to these and confront within myself which of these I am gifts I am rejecting as I am driving off into another spiritual ditch. Sometimes, just naming which Gift I am rejecting will help me slam on the brakes and veer back on the road. Sometimes, its a combo. Sometimes — its all of them! Lord have mercy, Christ have mercy!